In my previous blog post, I wrote about my recently published paper in ECOSYSTEMS. When one reads such a study, they rarely know how much work it takes to come to the end with 10 nicely written pages with a story from the results. In this case, I will tell you about how we measured CO2 fluxes. 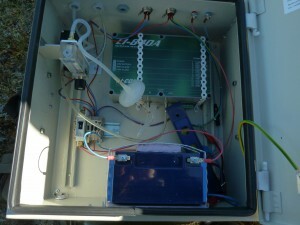 Usually gas fluxes are measured in the lab, near a road, and/or with plexiglas chamber. You can also go big and have an automatic chamber on each plot, but that’s only when you have several millions available. 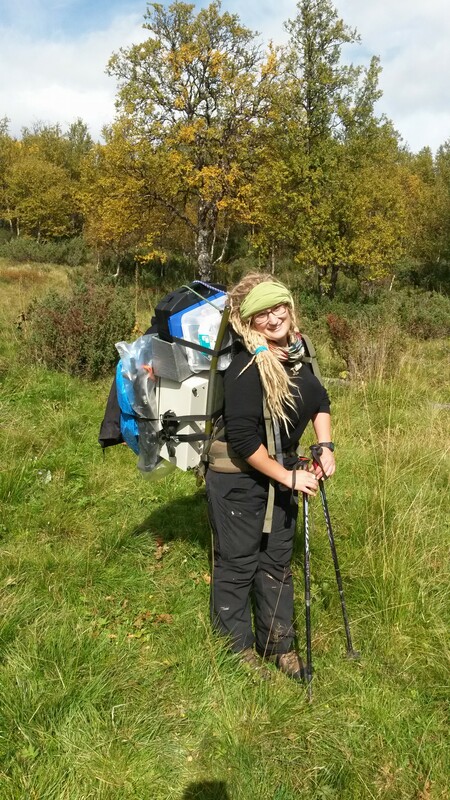 In my project, we had to find a low-budget solution that we could carry to the field sites up to an hour hike from the road. The solution should also be possible to use on willow shrubs. May I present Diana Eckert, Rozalia Kapas, and me, Mia Vedel Sørensen. Note that the video is speeded up, so what takes 30 seconds here would take 2-3 min in real time. 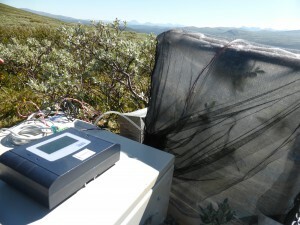 One measurement consists of a light measurement where the plant photosynthesis is causing a reduced concentration of CO2 in the chamber, though plants are also respirering, so what we get from this measurement is the Net Ecosystem CO2 Exchange. This is basically a measure of whether the vegetation is a source or a sink of CO2 in that moment. During the measurement, we measure soil moisture just right outside the plot in four different places and we measure soil temperature. This is what Diana is doing. 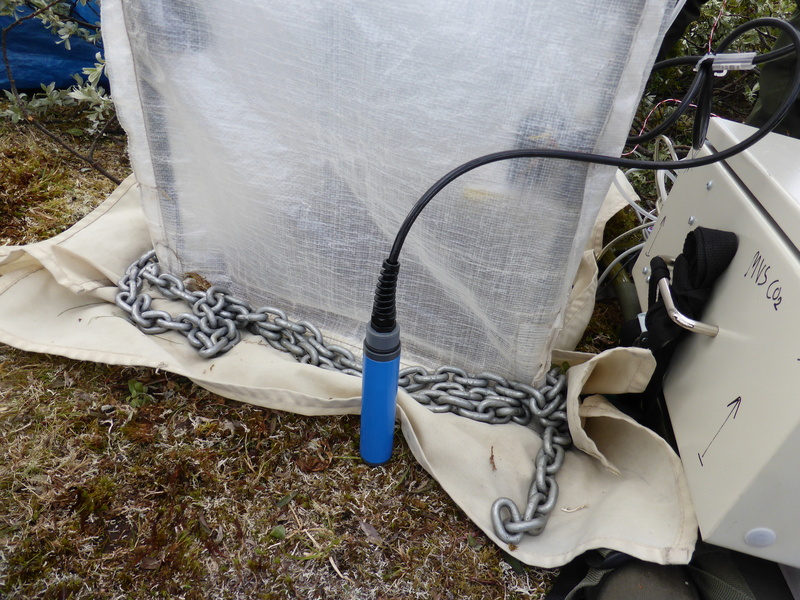 On the chamber a cable with two pt100 are attached to measure air temperature, one inside the tent and one outside the tent. 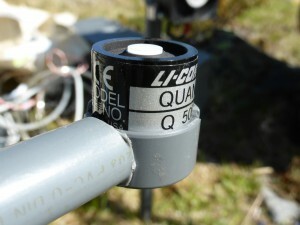 Surface temperature are measured year around in the plots with small temperature loggers in the surface 1 cm soil. The silver space blanket we put on top of the tent 18 sec in the video, creates total darkness inside the plot, and this is therefore called a dark measurement. When there is no light present, the plants stops photosynthesis, in the camber we therefore measure an increase in CO2 levels again. 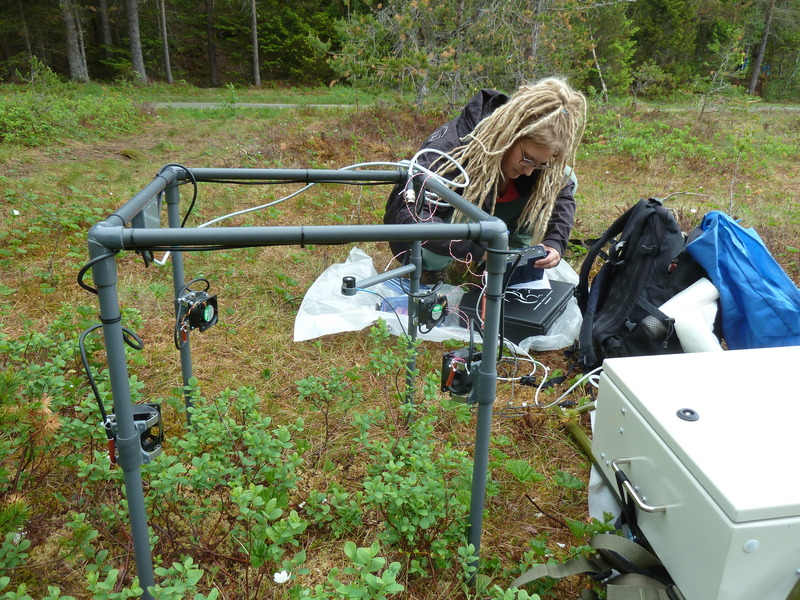 This is because the plants and organisms in the soil respire, and thereby release CO2 – so from this measurement we get Ecosystem respiration. When we have a light and a dark measurement, we can then calculate Gross Ecosystem Photosynthesis by subtracting Ecosystem Respiration from Net Ecosystem Exchange. This is then a measure of all the photosynthesis going on in that specific plot. It looks like I am doing nothing during the measurement, but actually I do something very important: I am looking at the datalogger (Squirrel2010) and I am checking that the measurement is of good quality. A bad measurement can occur when the chamber is leaking and outside air is coming in (despite that the chamber is sealed with a 5 kg chain), or if somebody is shading, or if a cloud suddenly comes by. 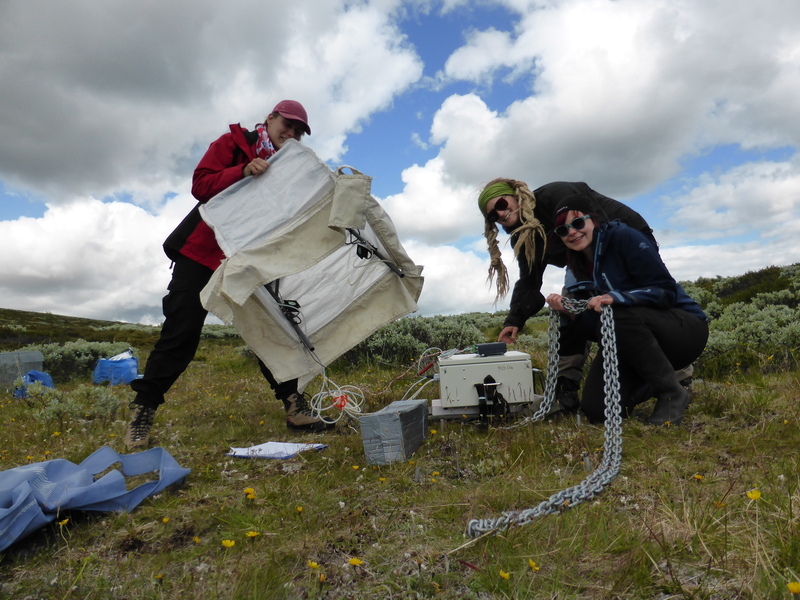 I check the data again when we are back in the lab, but checking it already out in the field gives you much more confidence leaving the site, it could be the one sunny day in a long. 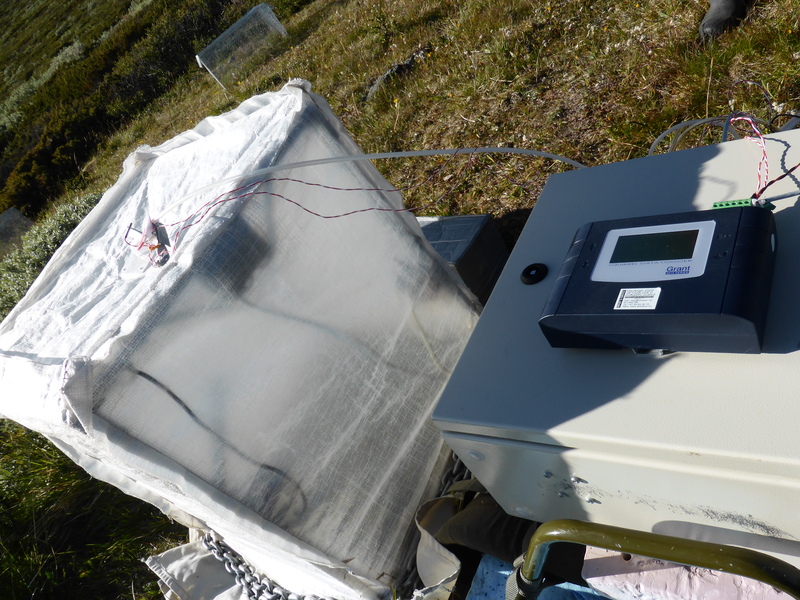 The big CO2 measurement challenge all field studies encounter is that good measurements are only possible to get when it is sunny weather. 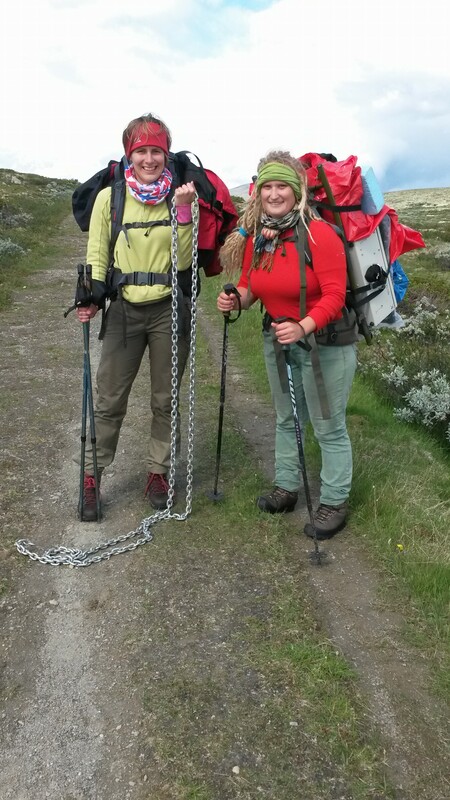 Those days are sometimes limited in the Norwegian mountains, and they sure were in 2015. 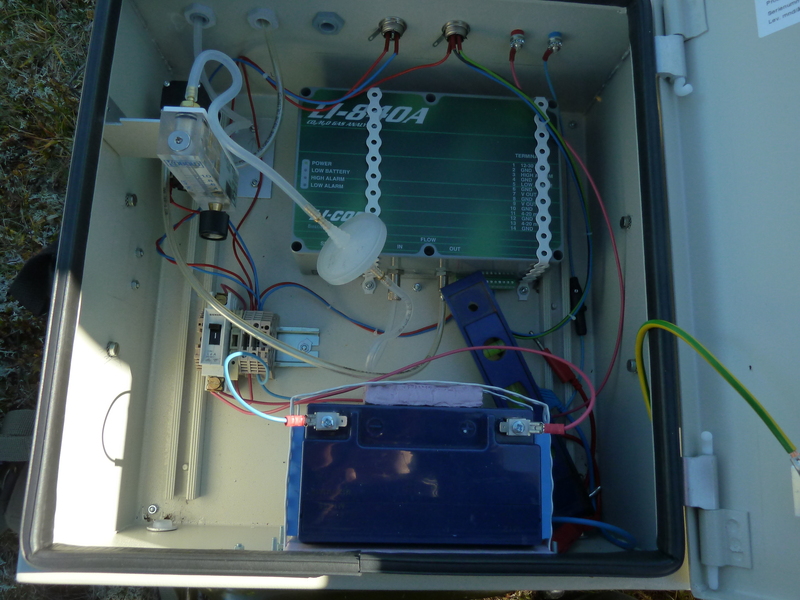 The other important task during the measurement is noting down the environmental data, but also the start and end time of the measurement. This is what Rozi is doing. When I have that data, I have made an R script to extract the data from the data-file for that time exactly. To do this manually is very slow. The output from the models are then a lot of graphs I can check, and the slopes are then used to calculate NEE and ER and is calculated for that specific measurement (see more details in Sørensen et al 2017). In the end of a measurement, we remove the textile from the poles, and get light intensity (PAR) outside of the chamber. Light intensity was otherwise measured inside the chamber during the measurement. Then we move on to the next plot. 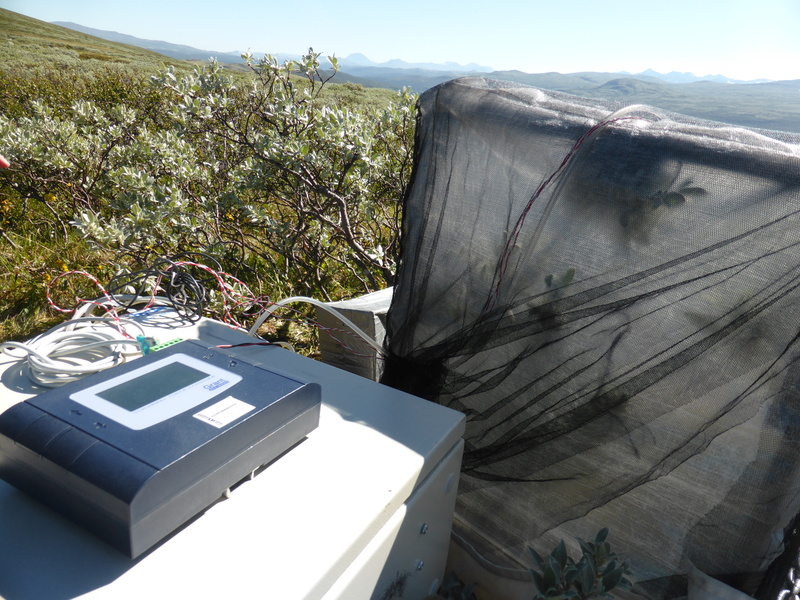 The first challenge in this method was to figure out how to make a chamber to capture the CO2 that was big enough to also measure on 50 cm tall willow shrubs, and that was possible to walk with without blowing away and being unhandy when hiking to the cites. We therefore used and modified a design that has been used by Enquist lab in University of Arizona, see more here. We had a tent sown on an industrial machine by Neil Prohaska and his father. Then our genius technicians Egil Thorsetnes made the chamber skeleton, with a special arm holding the light sensor, that measured PAR (photosynthetic active radiation), and old computer fans attached to the legs for ventilation. 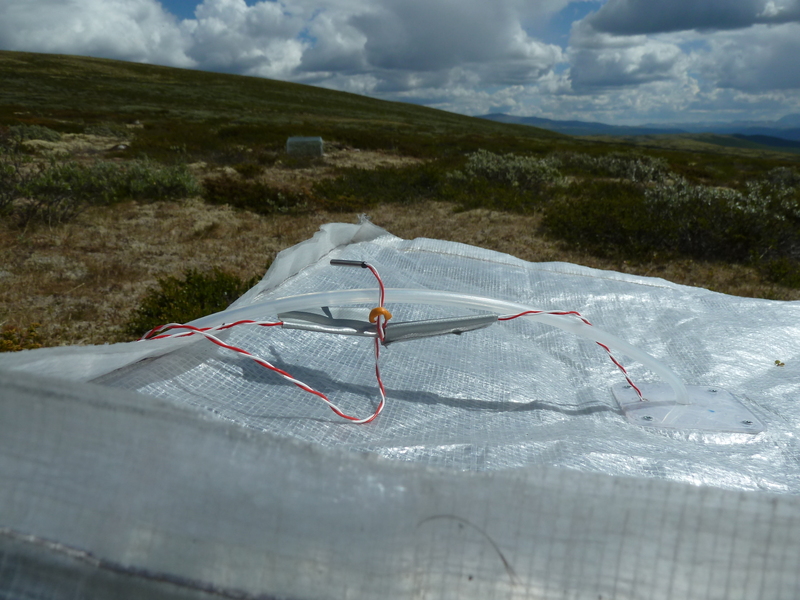 Our technician Rolf Skille made a special box where the sensible equipment was attached inside, protected from wind and rain. The box was fixed to a packframe that I could carry on my bag. This was when I sometimes felt like a ghost buster.